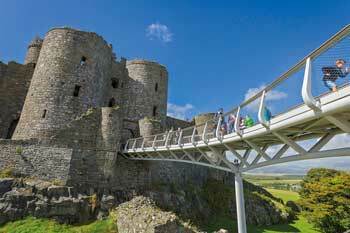 Designed as an S-shaped Vierendeel truss, a new footbridge links Harlech Castle with a new visitor centre and dramatically improves visitor access. Client: CadwHarlech Castle is said to be one of the finest surviving 13th Century castles in the UK and consequently it is a Grade I Listed Building, a Scheduled Ancient Monument and also part of a World Heritage Site. The many visitors who arrive at the site every year would testify that in the past access to the castle was strenuous as it was via a series of timber steps with no provision for the disabled. 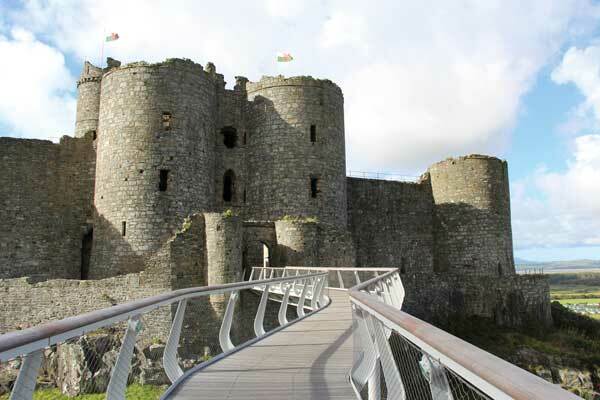 A new footbridge has changed all of that, by dramatically improving access and linking a new visitor centre to the castle. 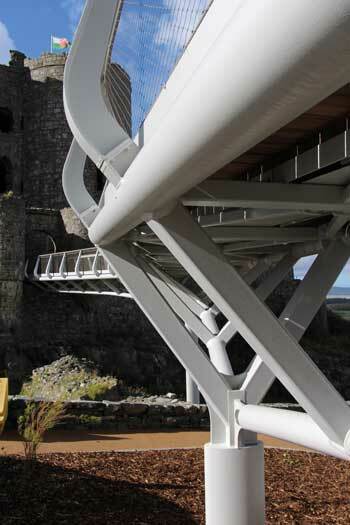 Project client, Cadw always had a clear vision for the footbridge and due to the sensitive nature of the historic site the aesthetics were an important consideration. Client consultants Mott MacDonald explored various concepts to satisfy the constraints of functionality, alignment, heritage and visual impacts before finally opting for the S-shaped low profile Vierendeel truss design. Both horizontal and vertical alignments were constrained by the need to connect straight through the castle’s gatehouse while maintaining a suitable gradient acceptable to those with impaired mobility. To minimise the impact of the views of the distant mountains of Snowdonia, tapering the bottom chords of the trusses and eliminating any diagonal bracing avoided a cluttered appearance and reduced the profile of the bridge. “Steel as a construction material offered a variety of structural solutions that satisfied the constraints of alignment, functionality, heritage and visual impact,” says Mott MacDonald Senior Engineer – Bridges & Civil Structures Katalin Andrasi. The visual lightness of the bridge is also significantly improved by the selection of a stainless steel mesh infill to the parapets. The deck is 2m wide in general, however it widens up to 3m above the middle support to provide an area where people can enjoy the views. To ensure that the bridge was future-proofed provision was made for services to be run in a duct under the bridge deck helping to supply power to a new venue within the castle where events and performances can be hosted. The first key area for development was the truss and deck configuration. The original proposal had fin plates welded to the back of the CHS (circular hollow sections) Vierendeel truss bracing elements, which then became the tee web in the handrail upright. This arrangement posed some fabrication challenges and raised the possibility of weld distortion in the fin plate attached to the CHS. An alternative was therefore adopted where SHS (square hollow sections) bracing was used and the handrail fabricated tee upright orientation was reversed. The face of the SHS vierendeel bracing then aligned with the flange of the tee to the balustrade and this was tapered to give an elegant transition to the handrail. To maximise headroom clearances under the bridge, and to give a more efficient structural solution at the supporting columns, the depth of the truss profile was modified and the bottom chord form was achieved from a combination of curved and straight sections of tube. The bridge’s dynamic performance required very careful consideration in the design. The columns needed to be very stiff in the transverse direction so an elliptical section was used which, when partly filled with concrete, achieved the required result. This choice also had the added architectural benefit of the elliptical column being less obtrusive on elevation, whilst approximately matching the profile of the truss chord. Before work started on site the existing façade was digitally scanned and the 3D survey was incorporated into the design model to ensure the critical dimensional interface between the castle entrance and the bridge was achieved. Bridge sections were set up in bespoke jigs to control weld distortion and maintain their geometry during welding. The bridge is lit with a bespoke integrated LED lighting system that delivers bright white task lighting to the walkway, but has the added benefit of having a number of colour-changing effects that can be accessed for special events. Controlled by a central PC, the lighting can also be operated via a smartphone or iPad, offering simple and intuitive day-to-day management. According to S H Structures Sales and Marketing Manager Tim Burton, perhaps the biggest challenge was the limited footprint of the site and the restricted access through Harlech. These challenges were overcome with the careful selection of the multi-wheel steer mobile crane and rear wheel steer transport trailers. Steel erection required meticulous planning and attention to detail to ensure a smooth and safe installation process. However, the unique historic nature of the site put even more responsibility onto the erection team. Following offsite matching of the deck units the assembly on site was perfect and the three main spans were installed without any significant problems. With the bridge sections in place the careful coordination of the fitting of the timber deck, parapets, lighting and services allowed the bridge to be completed in good time. 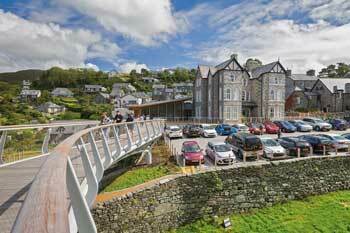 Opened in the summer of 2015, the new footbridge has been very well received and welcomed as an attractive addition to the historic site while enhancing the visitors’ experience. In a very sensitive setting this elegant bridge provides level access to the historic castle, whilst minimising its visual impact. The detailing and fabrication of the curved deck are exemplary, sum up the judges.